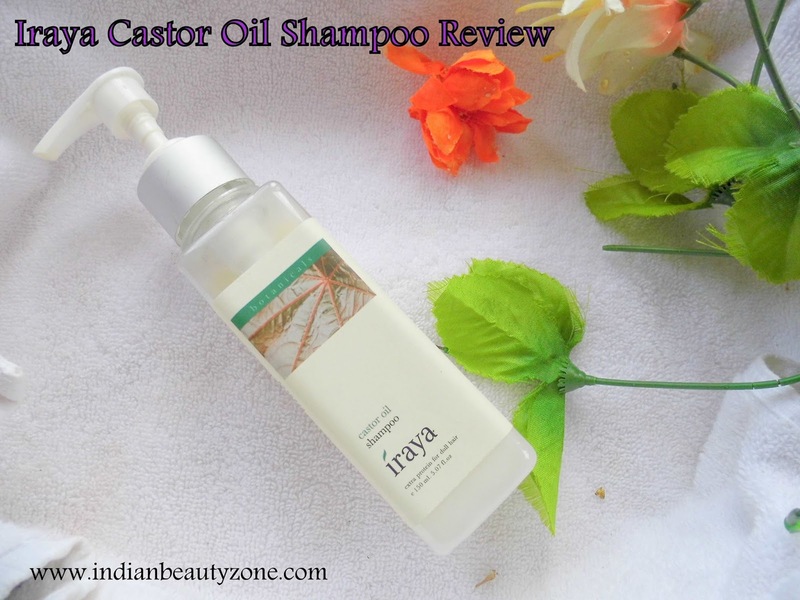 Iraya Castor Oil Shampoo cleanses and nourishes with castor oil and extracts of shikakai, coconut, rosemary, lime and mandarin oil, this extra protein shampoo cleanses the hair, without striping it of the essential moisture. Regular use provides hair with essential nourishment, improves hair texture and makes it more healthy and manageable. Shake the bottle well before use. Apply to wet hair and scalp. Gently massage in for 2 minutes. Wash off. For best results, follow with a suitable Iraya hair conditioner. 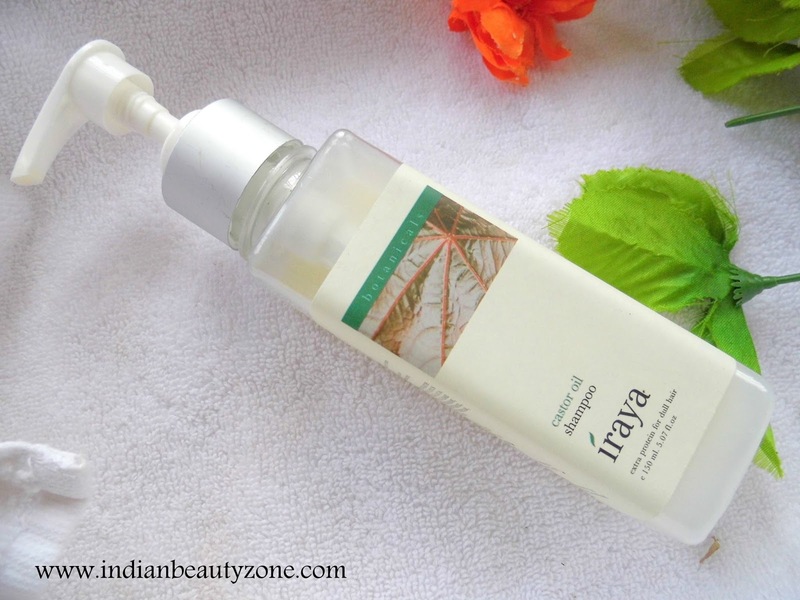 For exclusively dry scalp, apply an Iraya hair oil for 30 minutes before shampooing. Aqua, Sodium Laureth Sulphate, Castor Oi, Ricnus communis, Shikakai, Acacia concinna, CMEA, CDEA, Seasame Strearic Acid, Vegetable Glycerine, Citrus Grandis, Phenoxytehanol, Essential oils of Harshringar, Lavender, Ylang Ylang. This shampoo comes in a cute sturdy plastic bottle with a pumping dispenser. It is very compact and pretty easy to carry with you in your travel bag. The colour of the shampoo is light sandal like colour and the smell is purely herbal and I can identify the Lavender smell from it. The texture is bit thick and it is neither runny nor solid. I love this shampoo actually because of the Castor oil presence in it. I am bit disappointed with this shampoo because of SLS presence. I love the herbal and mild smell of this shampoo when I use it every time. This shampoo lathers well and cleanses the scalp well. Actually I have oily scalp and this shampoo cleanses it very well. The only thing I didn't get the conditioner with this shampoo, so I did not use any other conditioner after shampoo wash. So, though I feel softness on my hair after washing I didn't feel the silky smooth and the hair end looks bit dry. Otherwise I feel very comfortable with this shampoo that it doesn't makes my hair frizzy and I am sure the Castor oil presence in it is helping the hair to make soft. This shampoo didn't cause any damage or new hair fall. This shampoo absolutely suits for my oily scalp and dry hair ends. Only thing I have dry hair ends and this shampoo doesn't helps much to make them soft, may be if I use the conditioner the problem can be solved easily. But for those dry ends I use Hair serum and it becomes manageable after applying it. So, I have no worries about this problem much. Castor oil as ingredient which is helpful for hair care. Iraya Castor Oil Shampoo is a good shampoo for those who wants to use paraben free shampoo and helps you to make your hair looks good and soft. It doesn't makes the hair frizzy. Do try it with its conditioner for more good results.